This chapter is concerned with robust guaranteed cost control for uncertain linear time-delay systems with quadratically constrained uncertainty using a linear matrix inequality (LMI) approach. We only consider the case of using memoryless static state feedback in this chapter. 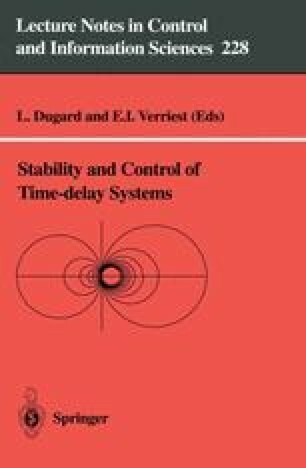 Two specific problems are considered in this chapter, namely the robust guaranteed cost control problem for linear systems with single state delay and the one for systems with mixed state and input delays. We show that feasibility of some LMIs guarantees the solvability of the corresponding robust guaranteed cost control problem.